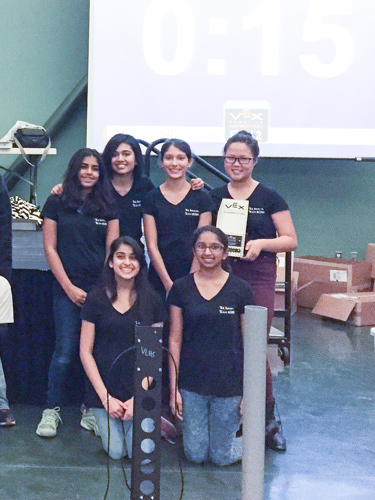 Last week, grade 9 students Anooshree Sengupta, Mona Lee, Maya Kumar, Aria Coalson, Aliesa Bahri and Jessica Susai – collectively known as the Harker Infinities – were named champions at the Central Valley VEX Robotics Challenge held at Modesto Junior College. The team had spent months in preparation, meeting every weekend since before the school year had even started. “Our team has been working on the robot since summer during four-hour practice sessions each Saturday and Sunday,” said Coalson.